The Salicaceae family is a large group containing many different types of willow, from the large weeping willow to smaller varieties like the flamingo Japanese willow tree, also known as the dappled willow tree. So what is a flamingo willow and how do you take care of dappled Japanese willow tree? Read on to learn more. What is a Flamingo Willow? 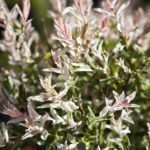 The flamingo willow tree or shrub is a popular Salicaceae varietal grown for its stunning variegated foliage. 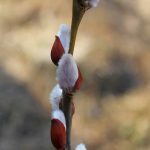 Growing dappled willow trees have leaves that are light green mottled with white in the spring and summer and the “flamingo” inspired new growth of deep pink color. In the fall and winter, the tree really stands out with bright red stems showcasing the unique foliage, which will eventually yellow and drop off. Dappled Japanese willow tree blooms with yellow catkins in the early spring. Depending upon which rootstock you purchase, flamingo willows (Salix integra) may be either a tree or shrub. ‘Standard’ rootstock develops into a tree that will attain heights of about 15 feet tall and as wide. When it is sold as a shrub, it must be pruned to maintain the starburst shape and reign in its growth to between 4 and 6 feet. This non-native deciduous tree is suitable for USDA hardiness zones between 4 and 7. 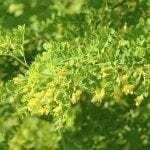 It is a non-invasive plant that is well suited to most gardens due to its relatively manageable size. Flamingo Japanese willow is a rapid grower. The tree can be kept down in size by pruning during the spring months, which does not phase the plant, and in fact, promotes summer leaf color and winter twig color. Dappled Japanese willow tree can be grown in a range of conditions. It is tolerant of sun to shade lighting exposures, although full sun will allow it to develop a pinker variegation. This willow will also do well in a variety of soils including moist soil, but not standing water. Because this tree does do well in damp soil, be sure to water deeply. This colorful addition to the garden adds year-round interest to the landscape and is virtually pest free.